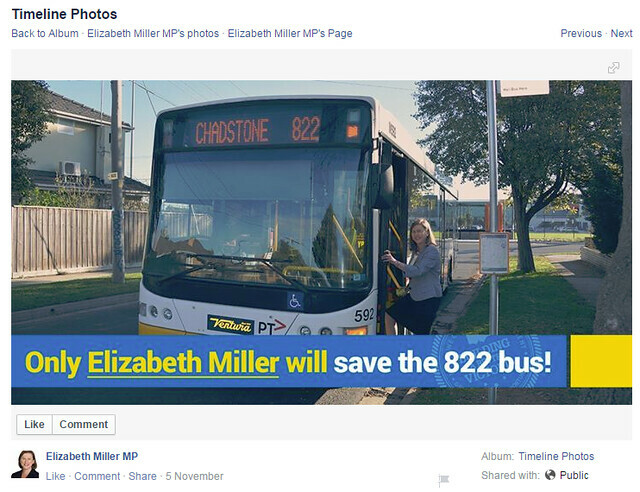 Incumbent Elizabeth Miller has gone strong on “saving the 822“, promoting via Facebook and an ad the front page of the local Leader newspaper last week, apparently trying to imply that Labor is proposing to scrap the route completely. 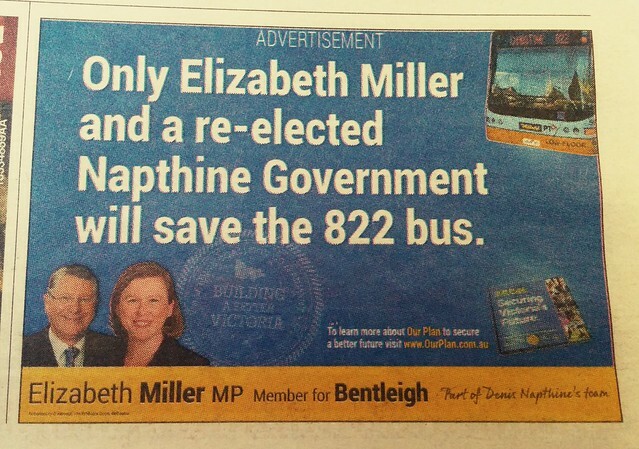 You cannot remove the 822.. its the only bus route running along east boundary road.. its central for anyone that lives around bentleigh area as its our way to Chadstone & Southland… You have gotta be joking. Our children use the 822 a lot. It is needed for children for school outings as well. … I also see many elderly using that bus as I believe it travels to southland and Chadstone which allows for them to shop and also catch up with friends. This is only a small part of how useful that bus route is. Think before you remove. Elizabeth Miller keep up the good work. For me and all the other passengers of the 822 bus rely on this bus because it gets us to our everyday destinations and without it would be a dissapointment! If you fet rid of this route you will make peoples lives much more difficult. please save the 822 bus. This is classic FUD — Fear Uncertainty and Doubt. There is NO plan to scrap the route. I asked the Labor candidate Nick Staikos about it, and he said their intent is the logical move of the route off the backstreets and onto East Boundary Road (as proposed in the 2010 bus reviews), for a speedier trip and to better space out the north-south bus routes — there’s a huge gap between the Frankston line and the 822, with no services on Jasper or Tucker Roads. But they’d do any change with community consultation to make sure as many people as possible are happy. Part of that change might be moving the 701 from Mackie Road onto Marlborough Street to cover the section removed from the 822. As I wrote a few months ago, that’d be a good solution as it would remove duplication on Mackie Road (which also has the 767). It would be difficult to have the 701 turn right from Marlborough Street onto North Road could be troublesome with no lights at that intersection, but the 2010 plan had it following the current 822 route as far as Duncan Mackinnon Reserve, then heading back towards Oakleigh. Labor aren’t talking about proposed bus frequency upgrades. The 822, like most suburban buses, is appallingly infrequent, particularly on weekends. Public transport spokesperson Jill Hennessy mentioned there was some kind of bus strategy coming, but so far we don’t know what’s in it. See below. There’s obviously some detail to nut out, but nevertheless the Liberals’ posturing is nonsense. It seems to be trying to imply that everything is fine with the local buses… clearly not the case. One way of reading it would be that “only the Liberals” will fail to do anything whatsoever to improve them. Fact is, local buses in Bentleigh do need improvement. Making the 822 a main road bus is a good start. Making it and other routes more frequent is also vital. PTV stats show the 822 has about 450,000 boardings per year — around 1600 each weekday, 575 Saturdays and 388 on Sundays — the latter not being too bad, given it’s only an hourly service, but given it serves two of Melbourne’s busiest shopping centres, there’s a huge potential to carry more people if it ran more frequently. Labor has said several times they would make an announcement around buses… This is important, as many areas only have buses. The policy has just been released today, and in summary is a $100 million package of upgrades. I haven’t digested the detail yet, but it’s got specifics on a number of routes, particularly the growth areas most dependent on buses. I can’t see anything in the Bentleigh area — not the 822, and also not the 703, which was promised an upgrade to full SmartBus status in the 2010 election by Labor. Update 25/11/2014: Partly for anybody clicking through from Jarrett Walker’s blog post, here’s the map of the current route, highlighting the diversion through Crosbie Road, Marlborough Street, Stockdale Avenue and Gardeners Road (including one-way sections) proposed to be changed to run direct along East Boundary Road (which is not shown in full on the map, but is a continuation of Murrumbeena Road) instead. It’s also worth noting that it was not just Labor and the 2010 bus reviews that proposed this change. Since taking office as the member for Bentleigh I have been shocked to discover that the former government made no provision for public transport to and from GESAC’s front door. Perhaps they could follow the lead of SkyBus and order Double Deck buses for this route? The sort of comment you get, from someone who has never actually caught a bus ! @Jim, bigger buses are not solving the problem. They would fix vehicle capacity, but the issue is the directness of the route and the infrequent service. More, not bigger, buses are what’s needed.